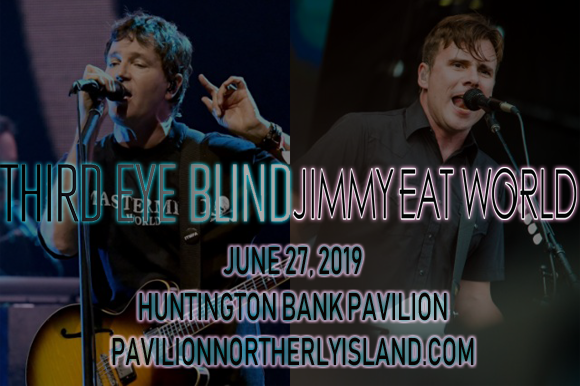 "The most scintillating, inspiring collective moments of my life have been outdoors in the summer exploding with music," says Third Eye Blind frontman, Stephan Jenkins. "Those sensations travel from when I was a little kid and rock music was brand new to our last Summer Gods tour, when everything is magically new again. I seek to create that exact blissed-out state of aliveness on tour this summer." Jimmy Eat World is an American rock band consisting of lead guitarist/lead vocalist Jim Adkins, drummer Zach Lind, rhythm guitarist/vocalist Tom Linton, and bassist Rick Burch. The band was formed in 1993 in Meza, Arizona and released its self-funded, self-titled debut album the following year, leading to a record contract with Capitol Records. Their major-label debut, Static Prevails, was released on Capitol the following year, but it was 2001's Bleed American, recorded without label support, that really put the band on the map. The album was a hit both critically and commercially, gaining platinum certification and launching four top twenty singles: "Bleed American", "The Middle", "Sweetness", and "A Praise Chorus". "The Middle" is the band's highest-charting single to date, reaching number-one on the Billboard Modern Rock Tracks chart and number five on the Billboard Hot 100. The band's sixth studio album, 2007's Chase This Light, is their most successful to date, peaking at number 5 on the Billboard 200. They have released nine studio albums in total, and their most recent release is Integrity Blues (2016).